California State University, Northridge’s Marilyn Magaram Center (MMC) and the Institute for Community Health and Wellbeing (ICHW) were awarded a $60,000 Community Benefit grant by the Kaiser Permanente Woodland Hills Medical Center. The money is being used to promote wholesome eating and improve health in Canoga Park. As part of Champions for Change, CSUN faculty and students work throughout the Canoga Park area to help to establish community gardens. Photo courtesy of the Marilyn Magaram Center for Food Science, Nutrition and Dietetics. The grant is supporting “Let’s Eat Healthy,” a program that provides courses and workshops for low-income individuals on how to establish and maintain healthy eating habits and home environments. While the growth in childhood obesity rates has led to a rise in nutrition education programs for youth, this program focuses on the role of parents and caregivers. “In order to make a change in the child’s environment, it is so important that parents are involved,” said Annette Besnilian, executive director of CSUN’s MMC for Food Science, Nutrition and Dietetics in the College of Health and Human Development. The grant will be dispersed over the course of three years. During the first year, the initiative provides courses in health and nutrition based on a SNAP-ED Connection curriculum — a study program that consists of course materials selected from the United States Department of Agriculture. The course subjects include food preparation, nutritious recipes and eating healthy on a budget. The courses also will include label reading workshops and visits to super markets and farmers markets. The program is holding five-week sessions at each of five sites through the fall of 2017 and spring of 2018. The sites include Hart, Callahan and Cantara Elementary Schools, Los Angeles Police Department/Topanga Division Police Activities League, and the Child Development Institute Early Learning Center. Community members can register for the course—for free—with the wellness council coordinators at any of the sites. Courses can accommodate up to 30 people each. Bilingual educators will be provided. Participating sites also will get help building or enhancing their own community gardens. Site leaders will be in charge of garden development, maintenance, planting, harvesting, and increasing community member knowledge of produce. 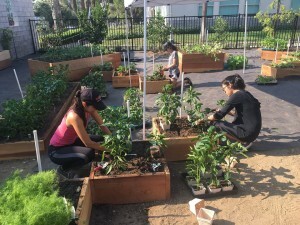 “People who participate in community gardening tend to eat healthier, and it’s also a great way to strengthen community and family bonds,” said David Boyns, director of CSUN’s ICHW. the third year, the initiative will turn the program over to new community site leaders and monitor how they sustain the program. Inspiration for the parent courses originated from MMC’s “Taste of Good Health” parent workshops. The program has been able to expand in Canoga Park through collaboration with the ICHW’s Neighborhood Partners in Action (NPA), an initiative focused in the Canoga Park area that is designed to help optimize the community’s resources, collect data from their needs and form partnerships to help generate relationships with them and at CSUN. The partnerships developed through the NPA have led to a number of programs specifically tailored to the local community, including a youth-oriented nutrition education and gardening program funded by the Los Angeles County Department of Public Health through its Champions for Change initiative. Through conversations with the community members and parents in Canoga Park, NPA officials were able to identify additional community concerns, said Besnilian. “Members praised the recent programs such as Champions for Change implemented in Canoga Park, but voiced concerns about adults needing additional classes and workshops,” she said. With the help of videos to show people’s perceptions of their needs, CSUN officials created a needs assessment to support development of the “Let’s Eat Healthy” program. The video voice mapping identified the community’s problems and their request for educational courses as a solution. “By July 2020, we hope our efforts will result in individual behavior changes, as well as changes within institutional settings and the environment around Canoga Park,” Besnilian said. “Our goal is to empower the [Canoga Park] community so they are able to develop and maintain these programs on their own to create a culture of health,” said Boyns.